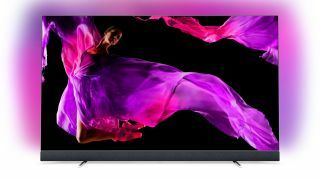 Cyber Monday TV deal: Philips flagship 4K OLED with B&W speakers | What Hi-Fi? The awesome Philips OLED+ 903 TV that comes with B&W sound has just been slashed in price for the Black Friday weekend. Get it now but only at Currys and Richer Sounds. The TV itself is essentially the Philips OLED803 but with the B&W speaker system integrated as a soundbar on the bottom. So while looking great you get the front facing soundbar with 19mm titanium tweeters but also two more bass radiators and a central driver taking care of lower frequencies behind the screen. The OLED panel offers an impressive 1,000 nits of brightness, HDR10+ support and Perfect Natural Reality which aims to enhance SDR content. Everything runs on Android OS so there are plenty of apps and Alexa voice controls too. Now you can grab this fantastic Cyber Monday deal to get you the Philips and B&W sound and vision combination in your home for less. This is available in both 55 and 65-inch variants.